Abstract: In July and August of 2012, the Huu-ay-aht First Nation and the Bamfield Marine Science Centre co-hosted a ‘Coastal Field Archaeology’ course on Huu-ay-aht Government Lands in Barkley Sound on western Vancouver Island. Fifteen anthropology students from UBC, Simon Fraser University, and the University of Victoria participated with the support of two Huu-ay-aht youth, two instructors, and a teaching assistant. 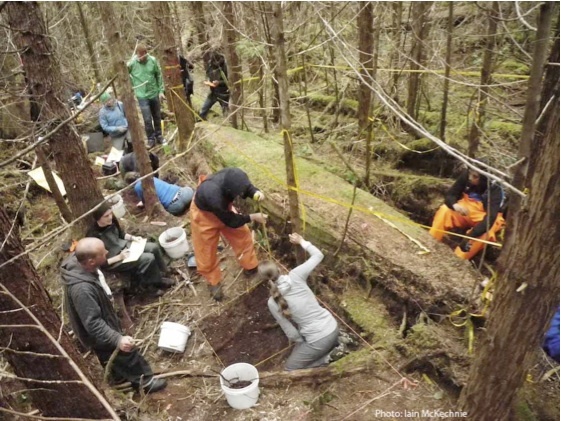 This presentation features highlights from the 2012 fieldseason which involved fieldwork at three very different sites strongly connected to recent and ancient Huu-ay-aht history (two coastal villages and one inland canoe manufacturing site). Students participated in survey and mapping, coring, and augering, as well as conventional excavation and column sampling all of which generated an exciting array of archaeological observations, including historic, precontact and nearly contemporary artifacts and house features. Nicole Smith (MA, UVic) has been working as an archaeologist in coastal BC for the last thirteen years as a graduate student, consultant, researcher, and educator. She presently works from home in Vancouver as a consulting archaeologist and enjoys collaborating on academically driven projects with First Nations and colleagues at UVic, SFU, UBC, and Parks Canada. Iain McKechnie is a coastal zooarchaeologist and a PhD candidate in the Department of Anthropology at University of British Columbia whose research focuses on Nuu-chah-nulth archaeology on western Vancouver Island. He has an MA from Simon Fraser University and is a former executive member of the Victoria Branch of the ASBC. This entry was posted in Archaeology, fieldwork, First Nations, Northwest Coast, Shell Middens, Vancouver Island and tagged Archaeological Society of BC, Archaeology, ASBC, fieldschools, Huu-ay-aht, Vancouver Island. Bookmark the permalink. How about a caption for the intriguing photo qmackie? Is that a canoe on the right? That is indeed one of three canoe blanks rediscovered by Professional Forester Steve Smith at a previously recorded CMT site in the Sarita Valley forest (the recorded CMTs being enormous stumps). Thanks for the response Jacqueline! what happened to this blog? is there anyone you can recommend if your retiring?